You’re probably thinking how can Weidman be Chael Sonnen 2.0, but not be ready for a title shot? 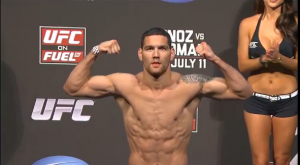 Chris Weidman had the best performance of his MMA career on Wednesday night as he destroyed highly ranked contender Mark Munoz via TKO, pushing his record to (9-0). He outwrestled one of the more decorated wrestlers in MMA and made it look easy with smothering pressure, and constant submission threats used to control Munoz and keep him on the defensive the entire first round. In the second round he used an incredible elbow counter to hurt Munoz and showed finishing instincts of a prime Wanderlei Silva. Weidman asked for the opportunity to face Anderson Silva in his post-fight interview stating he believed he had the tools to finish “The Spider”. While there is some truth to that statement, now is not the time to grant Weidman a title shot. It’s not because he doesn’t have the skills to beat Anderson Silva or to be competitive with him, it’s because nobody knows who he is. Weidman has five fights in the UFC with Wednesday being the first time he had ever headlined an event. He fought on the UFC on FOX 2 event that had over 4 million viewers, but his fight against Demian Maia wasn’t a memorable performance (granted he took the bout on extremely short notice). The only other time his has made the main card was in his UFC debut against Alessio Sakara. That event was on the Versus channel and was viewed by less than 700,000 fans. It’s true that Weidman has beaten two top ten middleweights, but Maia is no longer in the division and Munoz hadn’t fought in almost a year after coming off an injury that required surgery. That’s not to take anything away from those two performances as he won the fights convincingly, but Weidman needs a signature win against someone like Michael Bisping or Vitor Belfort as the co-main event on a PPV. He would achieve excellent exposure provided the PPV did a good buyrate, but better yet would have the opportunity to add a fighter with name recognition to his resume. Mark Munoz or Demian Maia have never moved the needle for casual fans. Anderson Silva just eliminated the one guy that had pushed him to the limit with ease in Chael Sonnen. Most casual fans are of the mindset that Sonnen was the only guy that had a legitimate shot at beating Silva. If Weidman is given the opportunity at this point, the casual fans that helped push UFC 148 to the one million buy-rate mark would most likely not be tuning in because Weidman would not be perceived as a legitimate threat to win. However, Weidman is a threat to beat Silva because he has a skill-set similar to Chael Sonnen. It’s actually better, which is why I’m calling him Chael Sonnen 2.0 (minus the mic skills though). Weidman has the same wrestling style that Sonnen brings to the table and the ability to push the pace while controlling his opponents. The two things that separate Weidman from Sonnen is that Weidman has an offensive submission game (with the submission defense to match), and has a reach that’s equal to that of Anderson Silva. We very well could be looking at a future champion in Weidman, but give him time to develop some name recognition. If he gets the signature win he’ll given the title shot against Anderson Silva provided the UFC doesn’t give him the Jon Jones treatment. If he’s able to beat Anderson Silva then Silva will probably be given an immediate rematch and then we would have a Frankie Edgar/BJ Penn situation. Edgar built his resume off of defeating BJ Penn in back -to-back fights (even if the first win was questionable), and Weidman could possibly do the same against Silva. The UFC middleweight division just got interesting again.